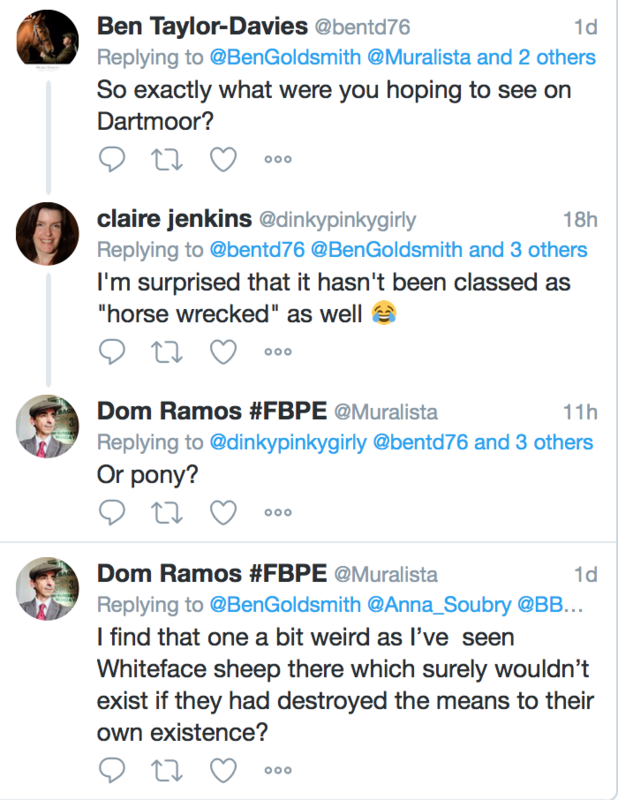 Ben Goldsmith joins the Defra Board – look out Dartmoor! 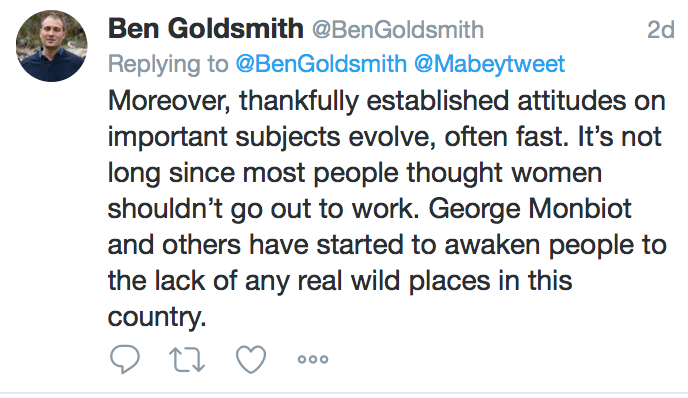 Ben Goldsmith is a well known environmentalist, he is the son of James and Annabel Goldsmith and brother of Zac Goldsmith, the Tory MP for Richmond Park. He has recently been appointed to the Defra Board. He is also a financial supporter of the Tory group of modernisers known as the Notting Hill set, which includes Michael Gove MP and Secretary of State for the Environment as a member. 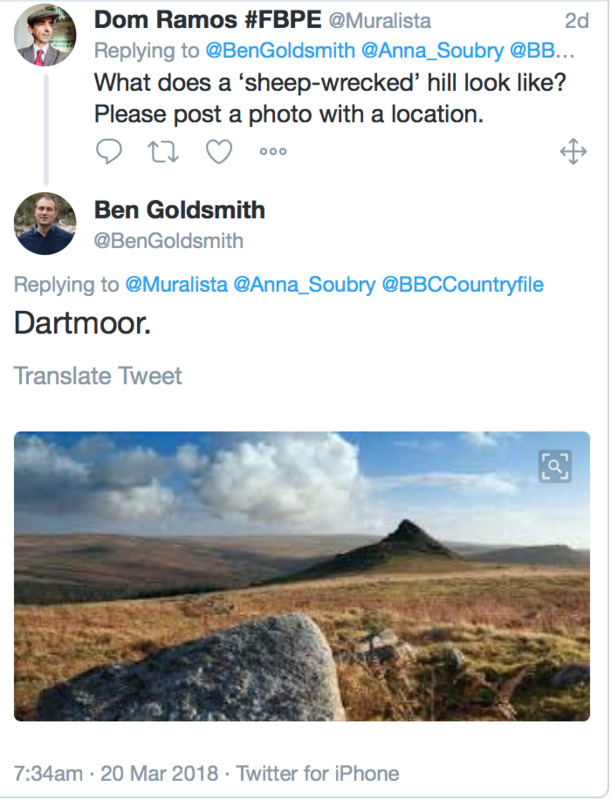 This series of tweets about Dartmoor may give us an insight into some of the thinking currently taking place within Defra. 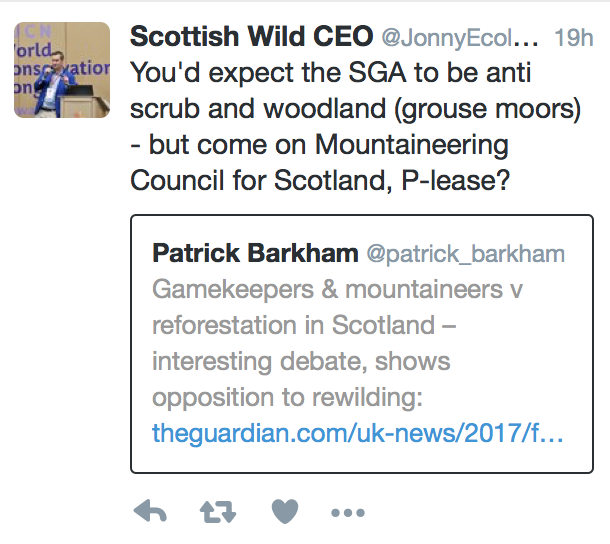 So is this what ‘public money for public goods’ looks like or we might be going to see some rewilding too? A bit of rewilding on the flanks of Cosdon Hill? When I was out on the moor on Saturday I took this series of photographs from Belstone Common looking over towards the north western flanks of Cosdon Hill. This photo appears to show Belstone Cleave creeping up the valley and it also shows a lot of scattered trees / scrub moving onto the moor. Anyone know how the scrub at the top of the picture managed to get a foothold or has this area always been like? This is the little valley called Lady Brook and this appears to be an example of what Matthew Kelly describes as ‘soft rewilding’, see here. Scrub appears to have regenerated along the stream and has created a rather good enhanced habitat. I suspect cuckoos might like this area? Lots of perches to look for meadow pipit nests from. As you move south further onto the Common the vegetation becomes more uniform and the scrub is restricted to the occasional bushes growing amongst the clitter. Seems a bit counter-intuitive – I would have thought the most intense grazing would be nearest to the settlements, in this case Belstone and Skaigh. 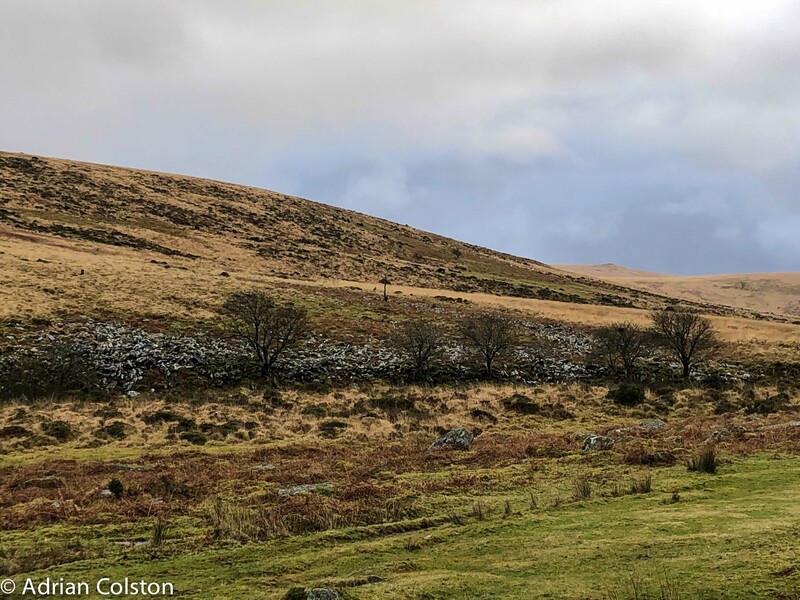 Mention the word ‘wild’ or any of its derivatives in connection with Dartmoor and conflict and argument will swiftly follow. 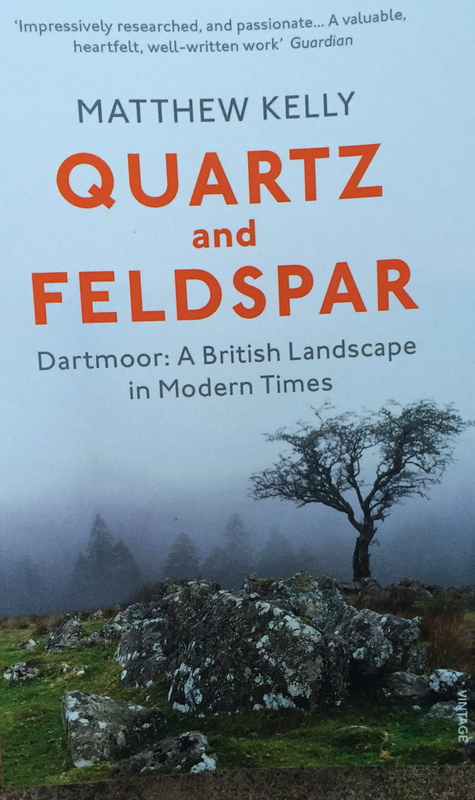 An oft – used phrase ‘Dartmoor – the last Wilderness’ is such an example as the farming community will quickly remind you that Dartmoor is not a wilderness or wild – it is in fact a man created landscape. The use the term ‘rewilding’ is currently entirely divisive, almost entirely as a result of the environmental journalist George Monbiot. 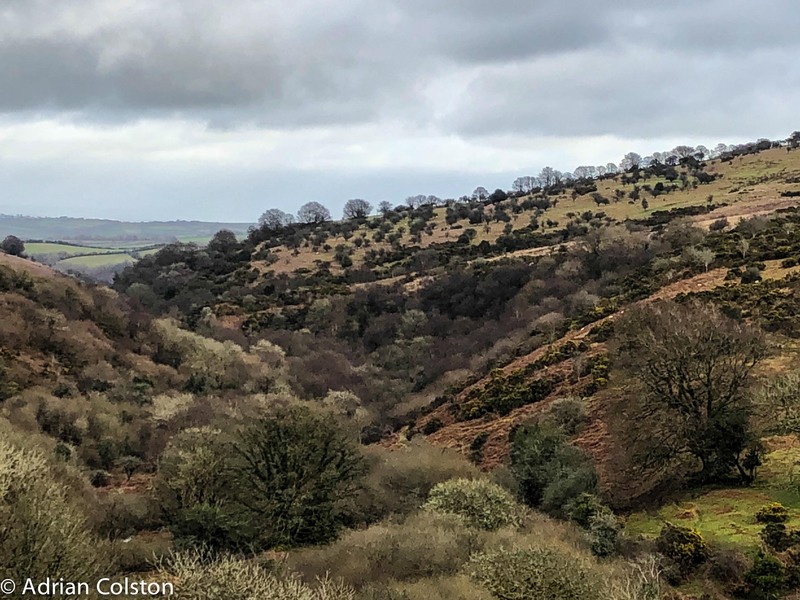 The first modern initiative to rewild Dartmoor began in the early 1990s by a small community group called Moor Trees  who wanted to see more deciduous woodland on Dartmoor. Their approach was generally inclusive, participatory and non-confrontational. 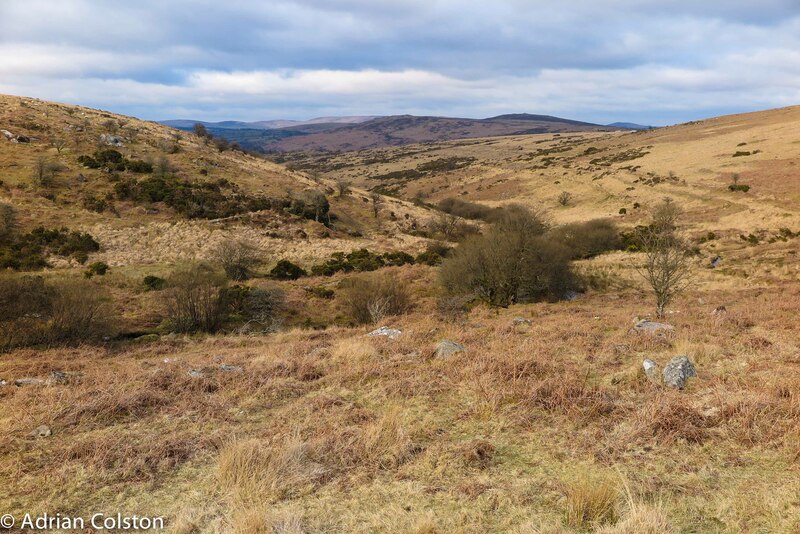 The next proposal came from Taylor (2005) where in his book Beyond Conservation he proposed that the south west corner of Dartmoor would make an ideal area where rewilding could take place. He suggested that as the land was in part owned by the National Trust this would help get the project going. He also suggested that this ‘rewilded’ corner of Dartmoor would be able to support a viable population of lynx. This proposal remained solely as an idea in a book, the practical complexities, obstacles and social implications were never explored or discussed with any local stakeholders including the National Trust. 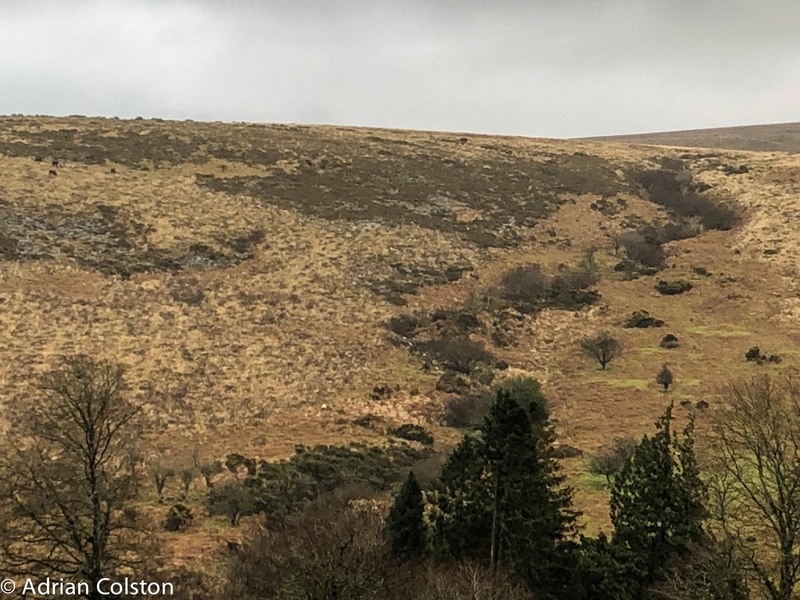 Indeed at the recent Dartmoor Society conference on rewilding Taylor said that the Dartmoor proposal had been abandoned due to the complexity of the Commons legislation (Kevin Cox pers comm). These two examples of rewilding perhaps indicate why the term is so misunderstood and so contentious. On one hand rewilding can be small scale, participatory and non-threatening whilst on the other it can be seen as imposed, far reaching and threatening. As a result many definitions of rewilding exist and the concept means many different things to different audiences. Monbiot (2013) in his book Feral provided his definition ‘The rewilding of natural ecosystems which fascinates me is not an attempt to restore them to any prior state, but to permit ecological processes to resume. ….. Over the past few decades, ecologists have discovered the existence of widespread trophic cascades. These are processes caused by animals at the top of the food chain, which tumble all the way to the bottom. Predators and large herbivores can transform the places in which they live. …. 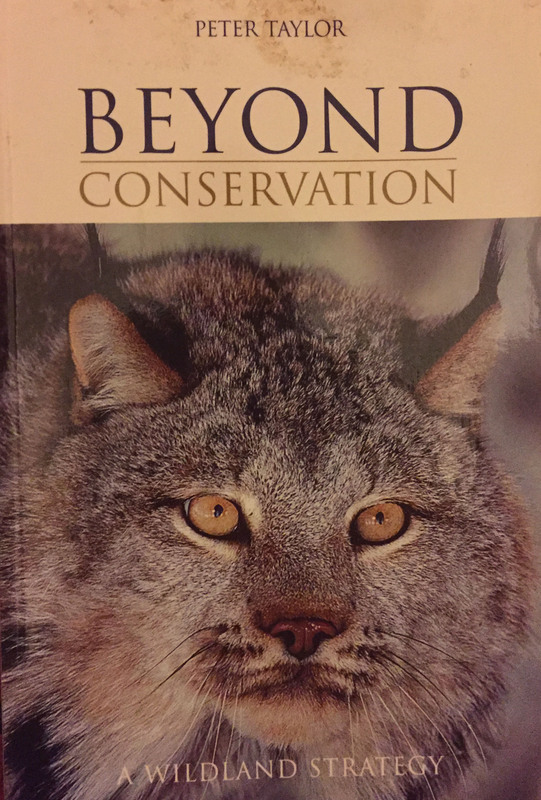 They make a powerful case for the re-introduction of large predators and other missing species.’ (Pages 8-9). As POSTnote (2016) points out there is no single definition of rewilding ‘but it generally refers to reinstating natural processes that would have occurred in the absence of human processes. With this definition it is clear to see why the Hill Farming community on Dartmoor has been so outraged and opposed to the idea of rewilding on the moor. It was therefore surprising when in October 2015, the Dartmoor National Park Authority invited Monbiot to come and speak on rewilding to the biennial National Parks Conference . 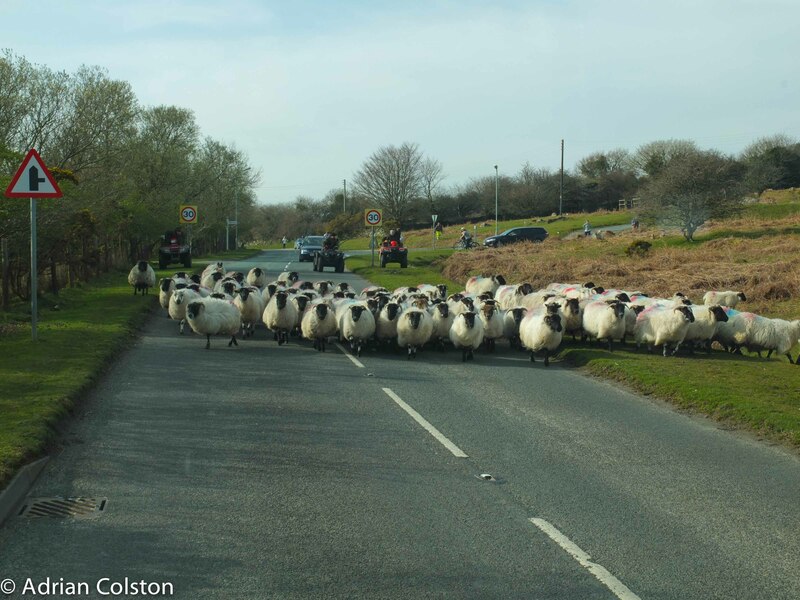 His used of words such as ‘sheepwrecked’ and ‘the white plague’ to describe his views of the sheep grazing regimes on Dartmoor caused widespread offence amongst the farming community  but won him many supporters from elsewhere . 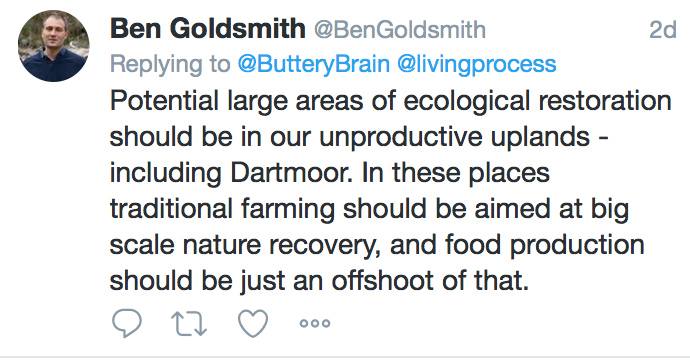 Monbiot has back on Dartmoor (and Exmoor) in January 2016 and this time he was lambasting conservationists for permitting, encouraging and engaging in swaling activities on the Moor . As mentioned in section 3.3 swaling is the deliberate burning of gorse, heather and grasses (particularly Molinia) on a rotational basis to produce new palatable grazing for stock. Monbiot considered this activity to be entirely inappropriate as it encouraged additional ‘sheepwrecking’ and stopped the natural process of grass developing into scrub and finally onto woodland. 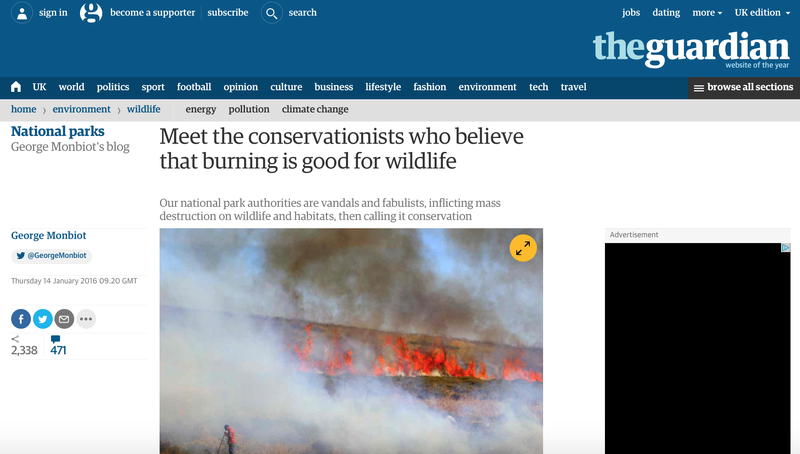 Perhaps more remarkably, Monbiot ended up being quoted in a Royal Society review paper on fire management for his remarks on Dartmoor swaling (Davies et al 2016a) which provoked a furious response from Monbiot in an article entitled ‘Bonfire of the Verities’ . This in turn led the authors of the Royal Society paper to publish a further paper (Davies et al 2016b) where they specifically address Monbiot’s concerns. I have critiqued this rather extraordinary situation and the original Royal Society paper as it focuses almost exclusively on burning to manage heather and ignores Molinia which as we have seen earlier (section 6.3.) is encouraged under some circumstances by burning . I have concluded previously  that Monbiot deliberately provokes controversy to make his point and by doing so creates a space where more measured debate can occur. Prior to his interventions this space did not exist. 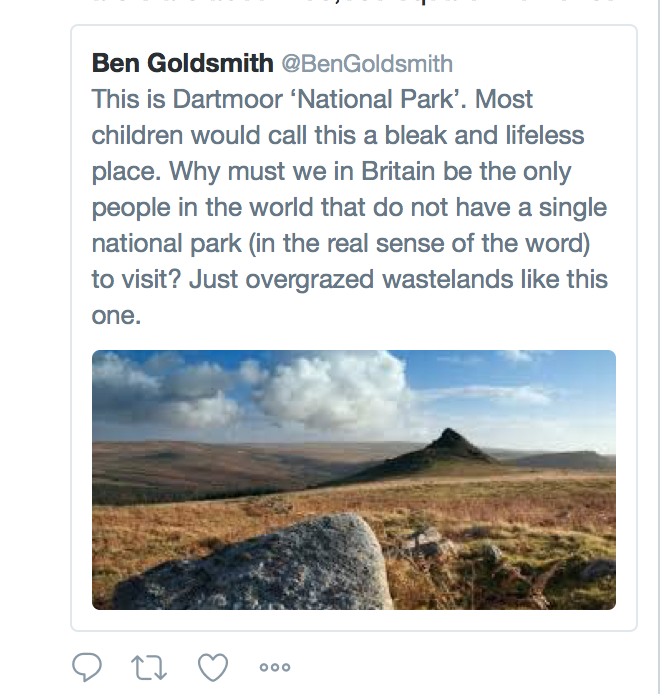 On the surface of this controversy it would appear that nothing is going to change, the occupiers of the land on Dartmoor have no intention of vacating it and Monbiot and his followers have no mechanism to enforce what they wish to see. To be fair to Monbiot he does suggest that the farming community could be retrained as ‘rewilders’ and therefore skill remain active on the Moor (Kelly 2015). However the arguments in favour of some form of rewilding are perhaps more nuanced. Monbiot has often talked about ‘ineligible features’  (and see his DNPA presentation for example), these are ponds, clumps of scrub and small groves of trees which if present on land where Basic Payment Scheme subsidy is being claimed means that the land in question has to be removed from the claim as the features in question are ineligible for subsidy payments. This has led to the wholescale removal of such features from large tracts of farmland. To many including some Hill Farmers this has been a step too far, an unnecessary removal of interesting and important habitat and landscape features. Kelly (2016) for example acknowledges that whilst a full blown form of rewilding may be undesirable and unimplementable perhaps something which he terms ‘soft rewilding’ might be possible. 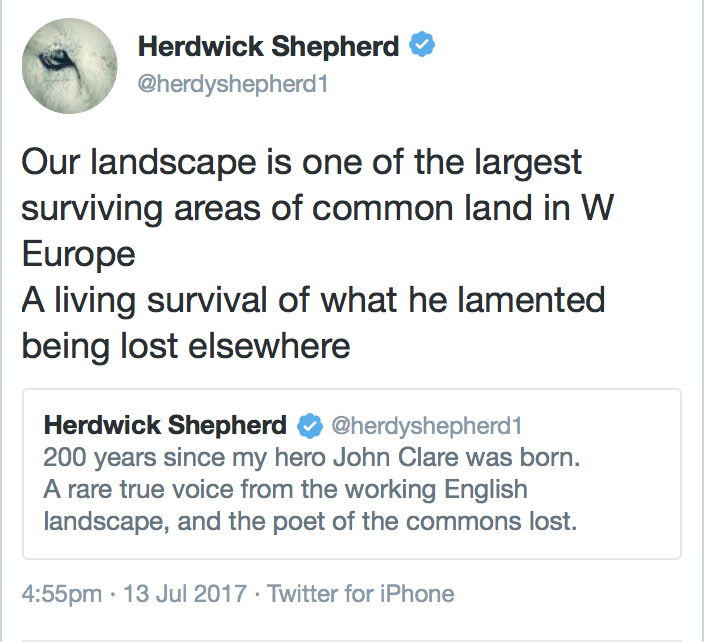 He suggests ‘Uplands denuded of trees and shrub absorb less water, particularly if soils are compacted by sheep hooves, which leads to faster run-off and more flooding in lowlands.’ I have written about the differences between ‘hard rewilding’ and ‘soft rewilding’ and have argued that the latter has a role to play in future management scenarios in the uplands by providing additional wildlife habitat and reducing the threat of flooding. These ideas have grown in attractiveness since the winter floods of 2015 and 2016 when the research in such places as Pontbren (Keenleyside 2013) demonstrated that uplands with tree cover absorbed 60x the amount of water than the adjacent pasture land. Natural Flood Management is being seen now as a useful option to deploy in the fight against flooding (EFRA 2016) and the uplands are seen as a key place where measures need to be taken. The ‘ineligible features’ regulations make it difficult to enact Natural Flood Management Schemes unless farmers are willing to forego some subsidy payments. It is possible to get a derogation to allow scrub to grow but this is a complex and time consuming process as Sir Charles Burrell explained to the Environmental Audit Committee (EAC 2016 p31) when describing his own experiences on his Knepp Estate. Now that Government Funding is becoming available for Natural Flood Management via the new Countryside Stewardship options the resolution of these issues become more necessary from the farmer’s perspective. Indeed Andrea Leadsom, the Defra Secretary of State made reference to ‘ineligible features’ in her key note speech to the Oxford Farming Conference on the 4th January 2017 when talking about cutting EU ‘red tape’, ‘No more existential debates to determine what counts as a bush, a hedge, or a tree’ . The decision to leave the EU is likely to have profound effects on Dartmoor and the uplands elsewhere. As mentioned in section 5, the economics of farming in the uplands (and elsewhere) are entirely dependent on the subsidies from the Basic Payment Scheme and the agri-environment funds. After 2020 future funding is not guaranteed. It has generally been signalled by Defra Ministers that in future public funding will be for the provision of ‘public goods’. Indeed George Eustice said on the 4th January 2017 at the Oxford Farming Conference that ‘UK farmers should expect support payments post 2020 for providing ecosystem services, but not subsidies’. 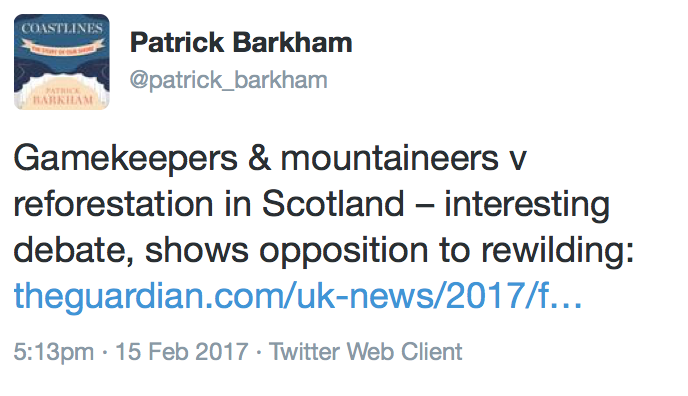 There will have been few people who would have thought that it might become Government policy to rewild large parts of the uplands, however this is not impossible – the Western Morning News and the BBC on the 4th January 2017 both ran a story which suggested that a leaked draft of the Defra 25 Year Nature Plan which they had seen included the idea that large parts of Dartmoor, Exmoor and Bodmin Moor could be allowed to rewild. Defra did not deny these reports and said they would be consulting in due course on proposals for the future of the uplands in the southwest. It is difficult to imagine how such a programme might be enacted without causing serious damage to local farming communities, issues of access, landscape characteristics, existing wildlife habitats and the historic landscape of Dartmoor which initiatives such as Premium Archaeological Landscapes aim to protect. There will be those who support such a move irrespective of the human and environmental costs as they will perceive that the wider gains outweigh the losses. Rewilding on Dartmoor which started off an abstract concept with no implementation mechanism has become a spectre which now can’t be ignored. 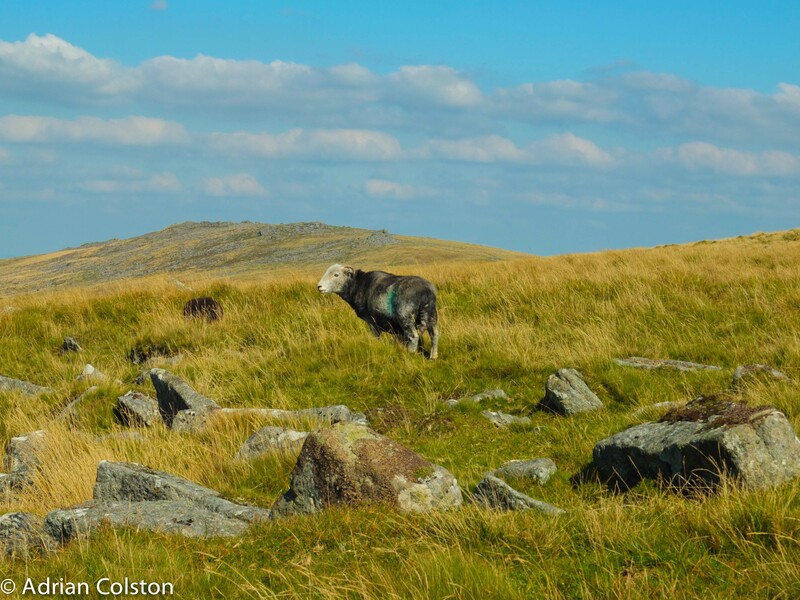 Hill Farmers and others will now have to wait until Defra publishes its consultation Green Paper on the future of farming later in the year which will hopefully cover rewilding and Dartmoor. Davies G.M., Kettridge N., Stoof C.R., Gray A., Marrs R., Ascoli D., Fernandes, Allen K. A., Doerr S. H.,Clay G., McMorrow J. & Vandvik V. (2016b) Informed debate on the use of fire for peatland management means acknowledging the complexity of socio-ecological systems. Nature Conservation 16: 59-77. EFRA (2016) Environment Food and Rural Affairs Select Committee. Future Flood Prevention. House of Commons. EAC (2016) Environmental Audit Committee. The Future of the Natural Environment after the EU Referendum. House of Commons. Keenleyside C. (2013) The Pontbren Project – a farmer led approach to sustainable land management in the Uplands. Woodland Trust and Coed Cymru. 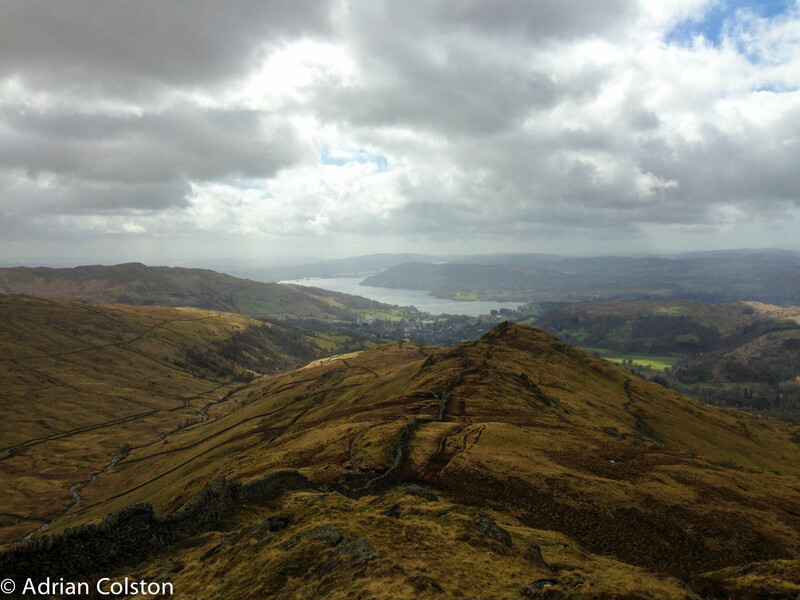 Kelly M. (2015) The Future of Britain’s Uplands: Thinking through History. Solutions July-August 2015. 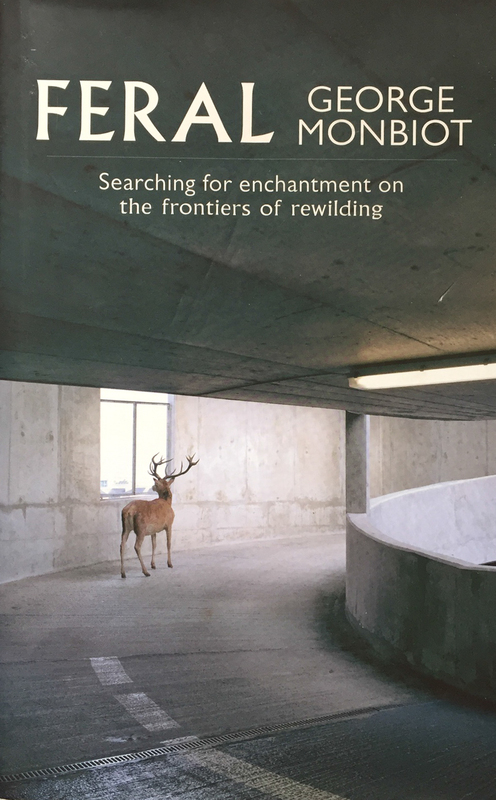 Monbiot G. (2013) Feral – searching for enchantment on the frontiers of rewilding. Allen Lane. London. Taylor P. (2005) Beyond Conservation – a wildland strategy. Earthscan. London. The Parliamentary Office of Science and Technology which in its own words ‘produces independent, balanced and accessible briefings on public policy issues related to science and technology‘has produced a briefing on rewilding. The POSTnote ‘explores the consequences of increasing the role of natural processes within landscapes. 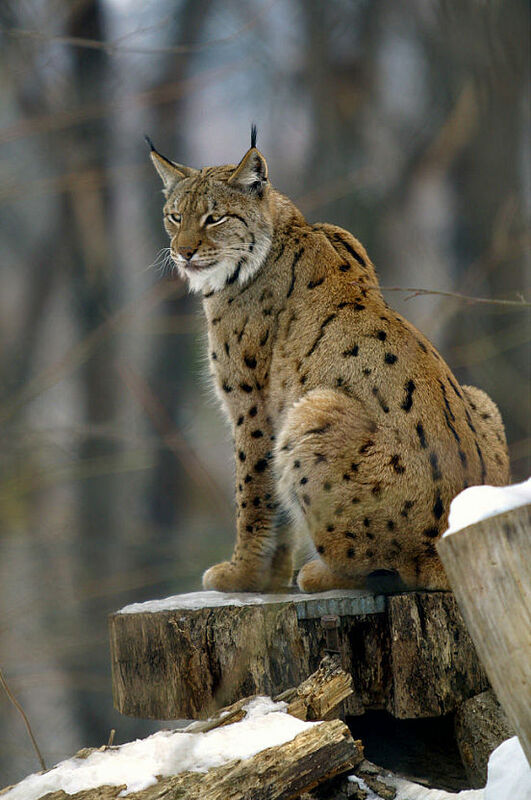 Evidence from the UK and abroad suggests that rewilding can benefit both wildlife and local people, but animal reintroductions could adversely affect some land-users‘. “There is no single definition of rewilding, but it generally refers to reinstating natural processes that would have occurred in the absence of human activity. In the long term, self regulating natural processes may reduce the need for human management, but in some circumstances human interventions may be needed to kick-start natural processes, such as tree planting, drainage blocking and reintroducing “keystone species” like beavers. Rewilding aims to restore natural processes that are self-regulating, reducing the need for human management of land. Few rewilding projects are underway, and there is limited evidence on their impacts. Rewilding may provide ecosystem services such as flood prevention, carbon storage and recreation. It often has low input costs, but can still benefit biodiversity. Some valued and protected priority habitats such as chalk grassland currently depend on agricultural practices like grazing. Rewilding may not result in such habitats. You can download the full POST report on rewilding here. It is a good independent, well referenced account which includes a number of mini cases studies (e.g. Knepp in Sussex and beavers in Devon). It also makes reference to the Great Fen project which I helped initiate in the 1990s and to the National Trust’s Wild Ennerdale Project in the Lake District. The report doesn’t specifically mention the Wicken Fen Vision which I set up in 1999 but you can read about that project here in Decolonising Nature: Beyond preservation – the challenge of ecological restoration see pages 247-267. This project shows how rewilding or ecological restoration if you prefer can enhance and protect a core area of high nature conservation value (and landscape and cultural value) as well as creating new wetland habitats along with a range of other social benefits such as access, flood protection, carbon storage and recreation. One of the key principles behind the Wicken Fen Vision and other rewilding projects is allowing natural processes to determine the outcomes. 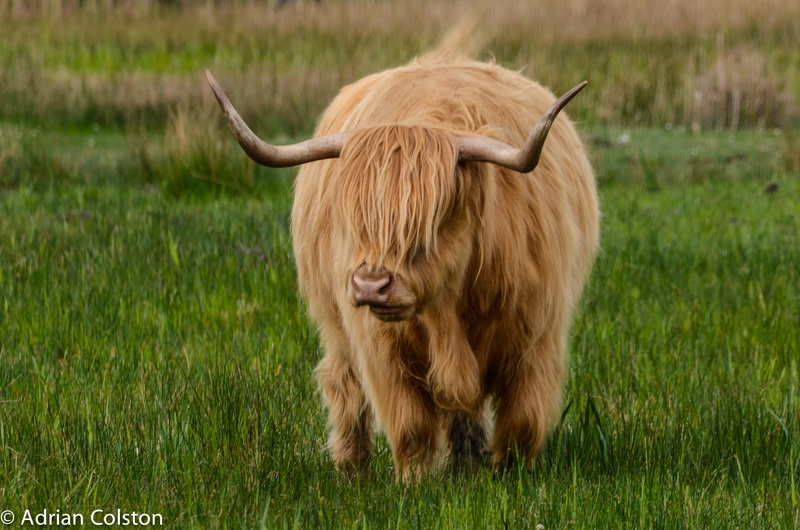 This means setting some parameters (the kick-starting referred to in the POST review), at Wicken these were water table levels and a low level grazing regime using konik ponies and Highland cattle and then letting nature determine the resulting habitats and species. 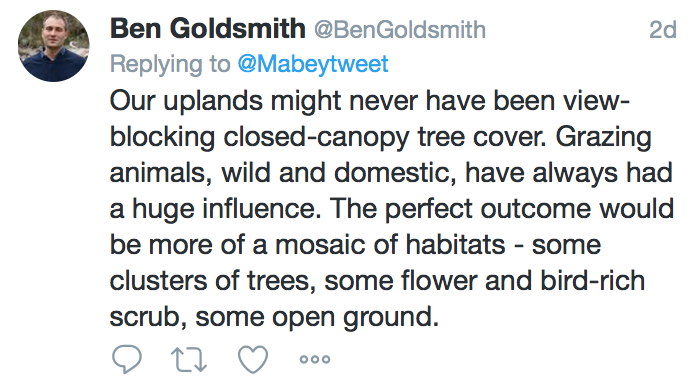 This is a different approach to say the bittern recovery work which RSPB led on in the 1990s where habitats were specifically manipulated to be attractive to bitterns. The latter technique is the one that nature conservation organisations have traditionally followed in the past. The former approach is more novel and as the outcomes are unknown is perhaps less attractive to those who want to ‘control’ habitats and species. You can read more about this approach in Restoring Riparian Ecosystems: The Challenge of Accommodating Variability and Designing Restoration Trajectories, work carried out at Wicken Fen and led by Dr Francine Hughes and Dr Owen Mountford. 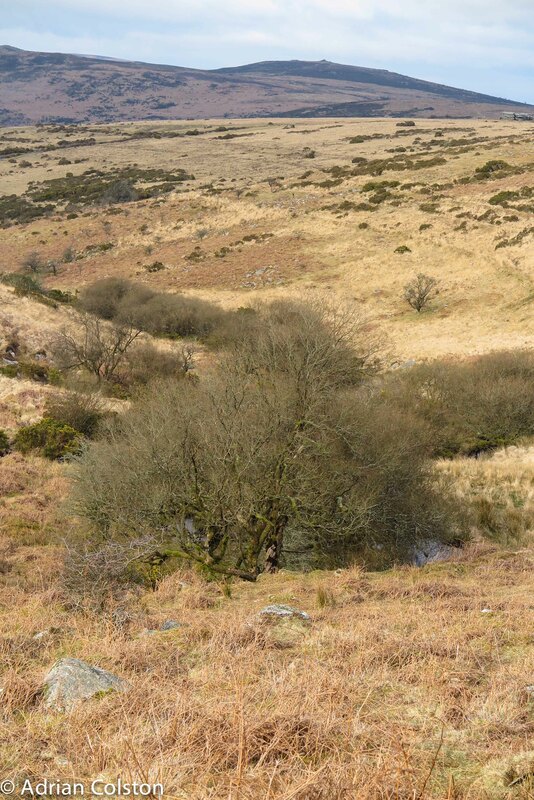 So how does this debate on rewilding fit into the Dartmoor landscape? There are of course some (for example George Monbiot – see here and Peter Taylor in Beyond Conservation) who specifically advocate a full blown rewilding approach with re-introduced herbivores and carnivores. 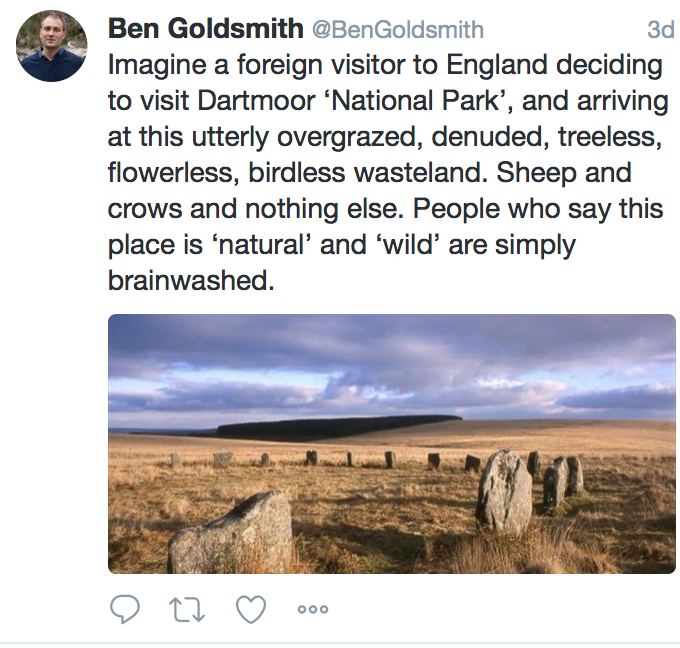 I, however, do not support such an approach here as it would lead to the loss of Dartmoor’s historic landscapes (its reeves, hut circles, standing stones, stone circles, pillow mounds, tin mining artefacts, medieval farms etc etc), it would lead to the loss of Dartmoor’s cultural landscapes (the Commoners, the Commons and the tenements etc etc), it would lead to the loss of Dartmoor’s existing and ecologically important habitats and species and it would lead to the loss of Dartmoor’s landscape with its ‘long views for which Dartmoor is renowned‘ (Ian Mercer’s words in his Collins New Naturalist page 27). That is not to say that everything should remain as it is. Matthew Kelly writing in the updated paperback edition of Quartz and Feldspar perhaps makes the best case for what could happen in the future. This is where he introduces his phrase ‘soft rewilding’. 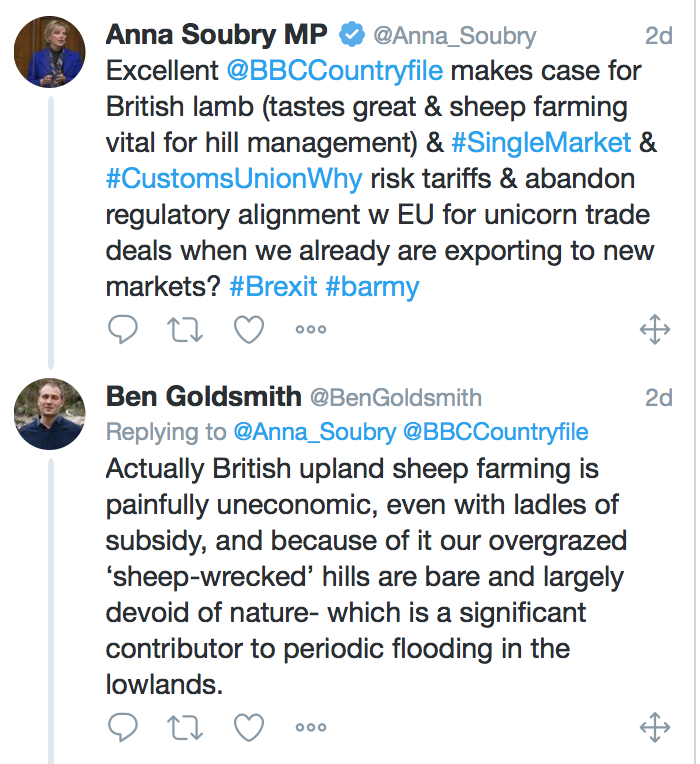 Such ideas are ‘of the moment’ as they chime well with the current debate about what should happen to agricultural subsides following our vote to leave the European Union – the ‘public money for public goods’ expression. The recent report from the National Trust ‘New Markets for Land and Nature’ (see here) shows how ‘soft re-wilding’ could provide a series of public and environmental benefits and improvements whilst still offering the opportunity to look after the existing historic, cultural, ecological and visual landscapes of Dartmoor. Of course if Government fail to come up with a timely new settlement to replace the Common Agricultural Policy subsidies which is sufficiently funded and attractive to the various stakeholders then a much harder rewilding of the moor may take place by default.